In the Group’s previous blog an Index of Shrines and Memorials which were erected in the Town’s Churches and Religious buildings was detailed. In the second of this series an Index of Shrines erected throughout the town by public bodies, businesses and societies will be provided. In addition several revisions have also been made to previous blog post. The shrines were constructed by Mr Kelsey and the names were written by Mr P Mahalski. Articles in the Goole Times suggests that the Shrines were regularly updated and flowers were still being laid at the memorials in 1919. After the end of the War there is only the occasional reference to the Shrines until 1930 when the Goole Times reported that as the shrines had fallen into disappear and neglect and because the names had been inscribed onto the Town’s Cenotaph and Parish Church Memorial they should be removed, unless the action was opposed. No evidence has been found for objections and it is assumed that the shrines were removed en masse and destroyed in July 1930. 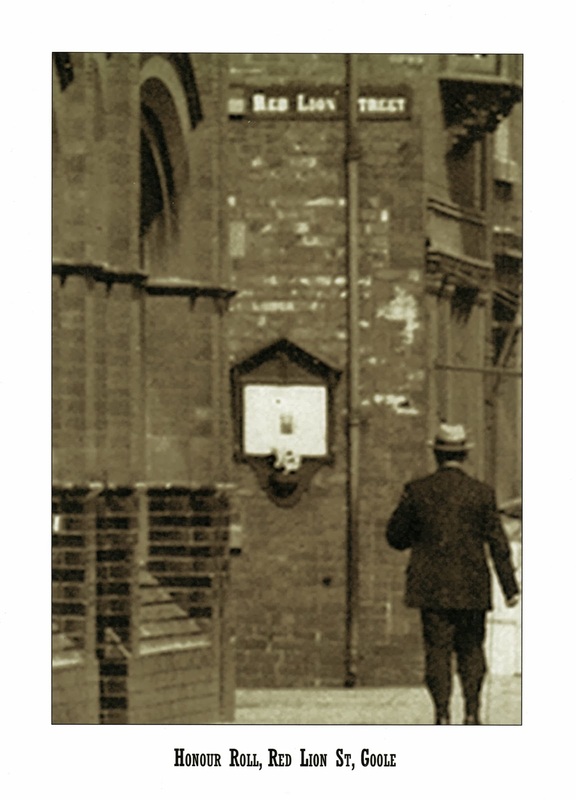 To date there is only one know picture of the Street Shrines, located in Red Lion Street, Pasture Road. As written above during the creation of the Goole Street Shrines it was controversially decided to exclude the men serving in the Mercantile Marine. After much debate it was declared that a separate memorial would be created. During 1917 whilst the names for the Street Shrines were collected the details of those serving in the Mercantile Marine were also collected, but it was not until June 1918 that the memorial would be erected. The erection of the memorial would lead to a near riot in the town as the original centre piece of the memorial contained a picture of the Jesus at the Sea of Galtree, which was made in Berlin, much to the anger of the town’s people (the storey is full is told in a previous blog article). The image was quickly removed and replaced by the flag of Mercantile Marine, painted directly onto the memorial. A Goole Times article of the period described the memorial as a structure of simple design made of polished teak, surmounted by a cross. Its position is described as commanding the attention of all those who pass it. It consisted of three glass panels, which contained the names of nearly 800 serving men, in alphabetical order. In the centre was a list of 37 men who had made the ‘Supreme Sacrifice’ marked with the inscription “Faithfull unto death”. Above the rolls were panels with the announcement and extracts from Psalm CXIII in gold lettering - “Men of the Mercantile Marine from the Parish of Goole who served their country on the high seas during the Great War” and “They that go down in their ships and occupy their business in great waters, these men see the works of the Lord and His Wonders in the deep”. Originally at the top and centre of the panel was ‘a beautifully finished print depicting Jesus and His Disciples on the Sea of Galtree’, later to be replaced by the Red Ensign. A flower bowl and permanent flower guard were provided close by. The location of the memorial is described as being just inside the Railway Station wall facing Boothferry Road. The lettering was executed by Mr Alfred Haigh, construction was undertaken by Messrs S.R. and T. Kelsey and the Goole Times printed the names. Until recently it was thought that no images of the memorial has survived but recently an image of Boothferry Road showing the memorial has been found, by local history collector Gilbert Tawn. 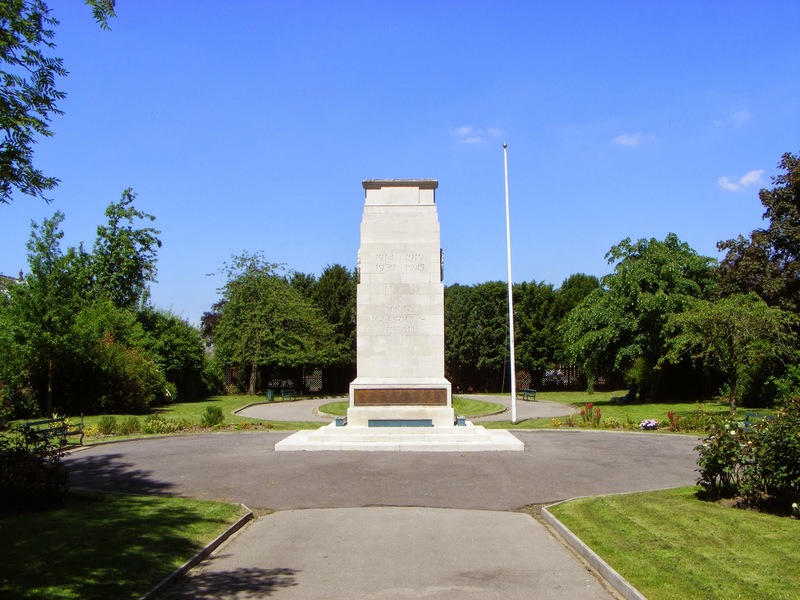 As the end of the War approached consideration was given to creating a memorial to commemorate the men of the town who had sacrificed their lives and served in the Armed Forces. The first meeting to discuss a war memorial was convened in December 1918, led by the Chair of the Goole Urban District Council. A War Memorial Committee was convened, with membership including Councillors, business men and representatives of the local church. Several ideas were considered ranging from a town war memorial, memorial for the victims of the Zeppelin raid, a public park, memorial hall and fund for ex-servicemen and families. In January 1919 thirteen options were considered for the town’s memorial and out of these three were selected – a town memorial, park or parks and a fund for soldiers’ and sailors’ dependants. A subsidiary scheme of a war memorial to the victims of the Zeppelin air raid was also agreed upon. The final scheme for the town war memorial was decided at a public meeting in May 1919, where it was favoured to create a public park and memorial, with the idea of a Fund abandoned due to a lack of interest. An ambitious target of £20,000 was set for the project, with the members of the committee delegated the responsibility of gaining public subscriptions. The history of the War Memorial Committee during 1919 and 1920 was chequered with poor attendance of meeting, differences of opinion in what form the memorial should take, accusations that the Committee and memorial were not representative of the town’s people, accusations that Committee members were 'figure heads' and not on the committee to work, the slow pace of fund raising and complaints about the longevity in the creation of the memorial. Eventually the committee disbanded in early 1920 although was later reconvened. The newly formed committee revived the idea of the war memorial with a less ambitious fund raising target, but with more focus, and the final result was the creation of a Zeppelin War Memorial and the Goole Cenotaph and Memorial Gardens. In June 1920 the newly formed war memorial sent a deputation to the Aire and Calder Navigation to discuss the donation of land for a War Memorial. The Aire and Calder Navigation Co. was agreeable to the deputation and by October a site in Boothferry Raid, opposite Bartholomew Hospital, has been decided upon. An option to purchase additional land, from the Aire and Calder Navigation Co. adjacent to the site was all agreed, for the creation of a Memorial Park. The Committee then set upon selecting the style of war memorial, considering four options, and agreeing upon a replica of the London Cenotaph, at a scale of 18 feet. In November the Committee had funds of £3100, with the overall cost of the scheme estimated at £4,350 – cost of land £1,350, memorial £1500 and laying out of the gardens £1500. Throughout 1921 the additional £1000 required for the memorial were raised, but again there was much complaint in the letters of the Goole Times about the slow pace of the war memorial, which ultimately led to the creation of the Parish Church Memorial (see previous blog). The unveiling of the Memorial would eventually take place in January 1922. The final memorial being a replica of the London Cenotaph, set in memorial gardens, and was erected by Mr H.O Tasker, of Goole. The memorial listing 452 men who had sacrificed their lives during the Great War. In addition to the creation of the Town War Memorial the War Memorial Commitee raised funds, by public subscription for a memorial to the victims of the Zeppelin Raid of 1915. The memorial is located over the mass grave of the victims, in Goole Cemetery, and was dedicated in February 1922 (see previous blogs). The design of the memorial is an inclined white marble book four feet long resting on two pots and stone based and surround by a curb, completed by Mr H.O. Tasker, of Goole. The memorial is dedicated “In memory of the citizens of Goole who lost their lives in a German Zeppelin raid on this undefended town on August 9th, 1915”, and lists the 16 victims of the air raid. ‘Who From this School Gave Their Lives in the European War 1914-1918’. Although the Organ does not survive the brass plaque is still displayed in the old hall of the Goole High School. 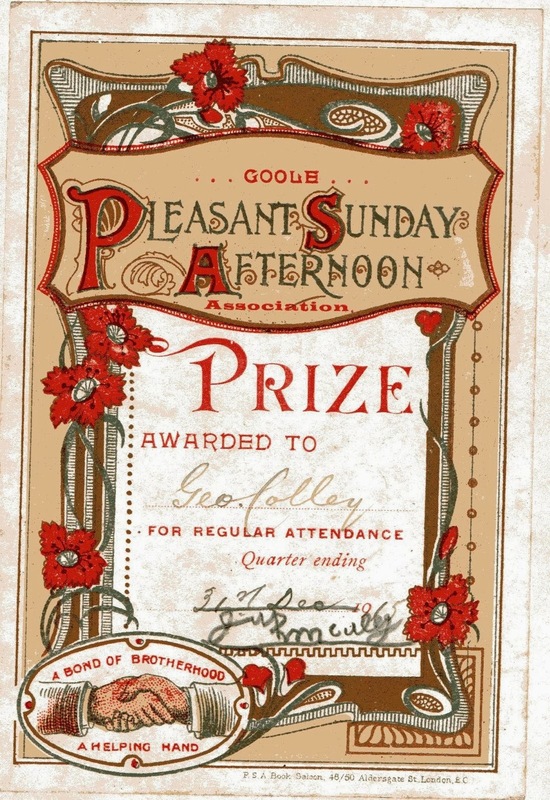 Goole Pleasant Sunday Afternoon Association. In a Goole Times article dated 18th January 1918 it was announced that a Roll of Honour had been created, listing 18 Lodge Members, of which 12 men belonged to the Aire and Calder (Goole Lodge). 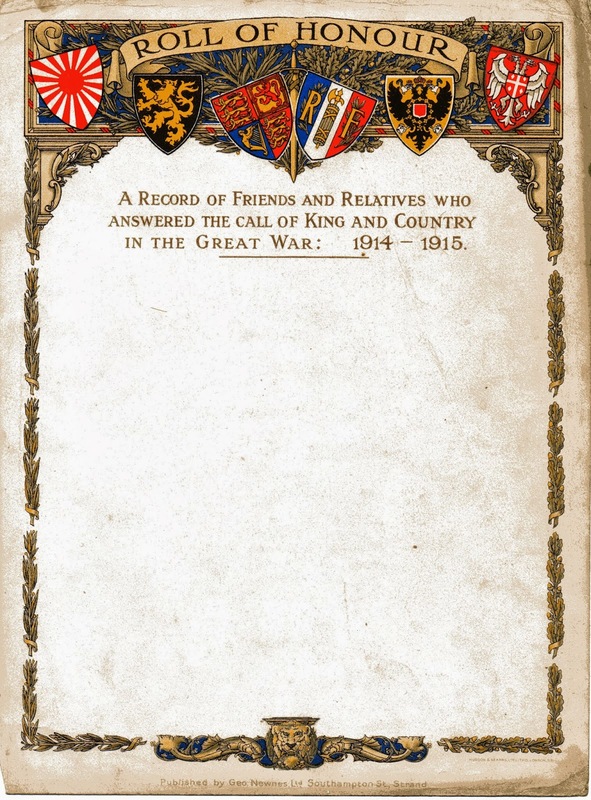 The current location of the Roll of Honour is unknown. Goole Shipbuilding and Repair Co Ltd.
Of these the following made the supreme sacrifice. The Silver Hall Mark informs that the Roll of Honour was made by Walker and Hall Silver Smiths of Sheffield in 1919. The Company also ran a shop in Hull. The memorial takes the form of a brass tablet surmounted by the flag of the Lancashire and Yorkshire Goole Steam Shipping Company. 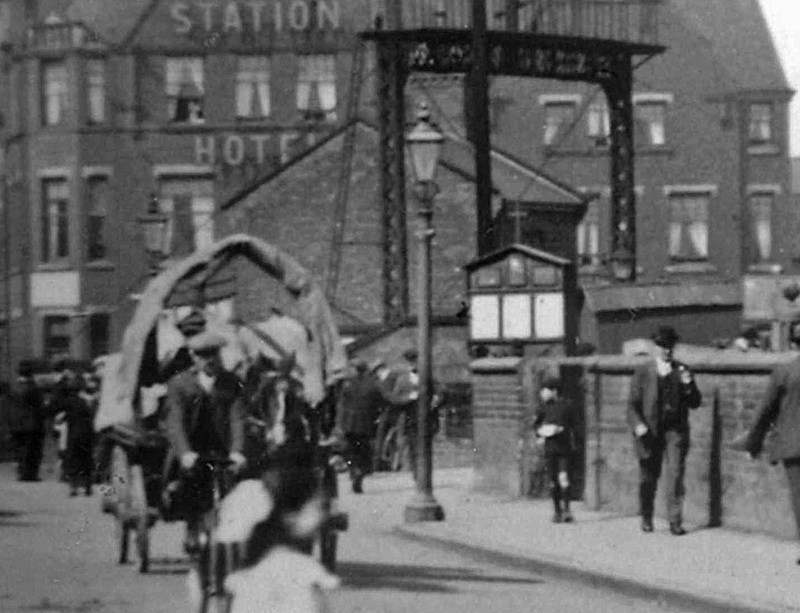 In Mr Winterbottom’s dedication there is a reference to a second memorial tablet for the men of the Goole Steam Shipping, this tablet, which was to be erected opposite to the above mentioned memorial, was to be dedicated to those who had served King and country and returned safely. The location of this memorial tablet is currently unknown. The list of memorials given above is as accurate as the surviving records allow and as the research and interest in the legacy of the First World War grows will surely be expanded. The large number of memorials erected in the town gives an indication of the great sacrifice and loyalty to ‘King and country’ by the town’s people. They also demonstrate the great need by the town to commemorate and remember all those who had served during the war and those who were never to return to the town and their form lives. In the last of this series of articles an index of memorials listing Goole men erected throughout the Country will be outlined.